The Supreme Court has reserved its verdict for Tuesday regarding the Centre’s plea to transfer the petitions challenging Government’s Aadhaar card project to a Constitution bench as the subject matter is one concerning authoritative pronouncement. "Whether the Right to Privacy is a fundamental right guaranteed under Part III of the Constitution of India, in the light of express ratio to the contrary by an eight-judge bench in M P Sharma case and also by a six-judge bench of this court in Kharak singh's case," one of the questions raised by Attorney General Mukul Rohatgi, who appeared for the Centre, reads. "If so, what are the contours of the Right to Privacy," another question says. Additional Solicitor General Pinky Anand also handed out questions which may be referred to the larger bench. Attorney General Mukul Rohatgi had yesterday reiterated the Government’s stand that privacy is not a Fundament Right as it is not expressly guaranteed under the Constitution of India. He further referred to earlier pronouncements, in cases like A.K. Gopalan, Maneka Gandhi and Bank Nationalization, and submitted that the discrepancies in the interpretation of certain Fundamental Rights should be allowed to be “squared up” by a larger bench. The Bench, comprising Justice J. Chelameswar, Justice S.A. Bobde and Justice C. Nagappan was hence told that a larger bench needs to decide whether privacy was a part of right to liberty and thus a Fundamental Right. The AG further brought to the Court’s attention that the Supreme Court had long back declared that privacy was not a Fundamental Right. He said that the judgment of 1964 (Kharak Singh v. State of UP) has been wrongly interpreted for 40 years. He hence contended that a few smaller benches had later “wrongly” held that right to privacy was a fundamental right by reading it in Article 21 (right to life) of the Constitution. This would not “eclipse the view held by the bench of eight and later six judges that privacy was not a fundamental right”, Rohatgi said. Meanwhile, the Petitioners shared affidavits of instances where citizens had been denied their rights: among them, an instance of a non-processing of a scholarship for a poor person, another of an individual denied a voters identity card for the lack of an Aadhaar card, and another of bank accounts not being allowed without Aadhaar. Subramaniam cited a June 2015 document focused on seeding Aadhaar. This document pointed out that the rationale behind Aadhaar is to guarantee that all of the information being collected is available across databases in a central repository, indicating that the state will have access not just to the information being collected by it for the purpose of validating identity, but also to all the linked information present in databases. Relying on this document, Subramaniam contended that the Government saw the NREGS as one of the best ways of seeding the Aadhaar database. He further highlighted the fact that the document states that the owner of the data is the UIDAI, and not the person whose data is being collected. This suggests that the UIDAI has the liberty to use the data for commercial purposes. Earlier, Senior advocate Gopal Subramanium, appearing for Mathew Thomas, one of the PIL petitioners, had filed an application seeking initiation of contempt proceedings against the Centre and others, including RBI, and the Election Commission, for allegedly insisting on Aadhaar cards to grant benefits of various schemes to citizens, saying it was not mandatory. In furtherance of earlier orders, Centre has communicated to the States and concerned authorities to make Aadhaar card optional for availing various schemes, Additional Solicitor General Pinky Anand had told the court. You may also read: Unique Identification Disaster? 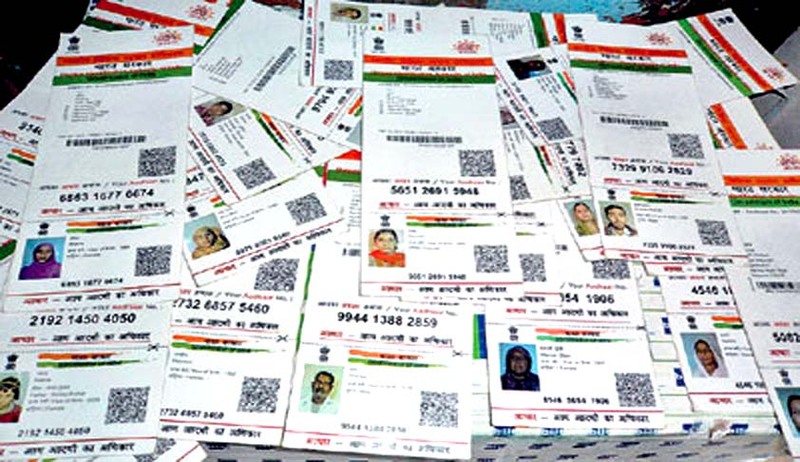 SC holds UID not mandatory, no biometric data to be shared without consent.